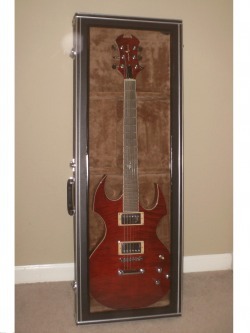 A Real, Functioning Guitar Case that is also an Incredible Display Case! ClearView Cases are the perfect crossover between a Display Case and a Functional, Portable Case. These are fully-functioning guitar cases, so you can show off your guitar collection in your house or soundroom, then just grab the handle and go gig with it! * Metal-framed, locking hardshell case. * Thick 1/4-inch acrylic window in the top cover.